Here in Syracuse, fall has definitely arrived. The trees are peppered with red, orange, and yellow and the leaves have begun their graceful journey to the earth. 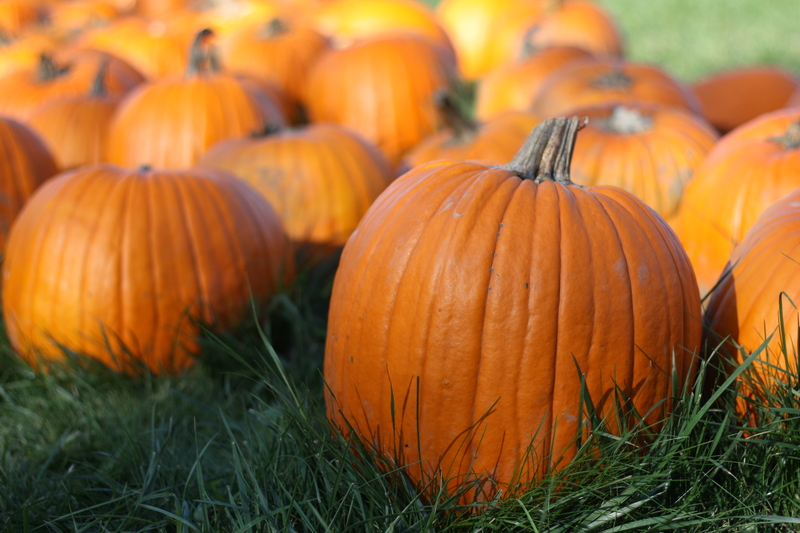 The crisp air has the rich smell of autumn, the kids are rejoicing in their collection of hoodies, and pumpkins are ripe for picking. 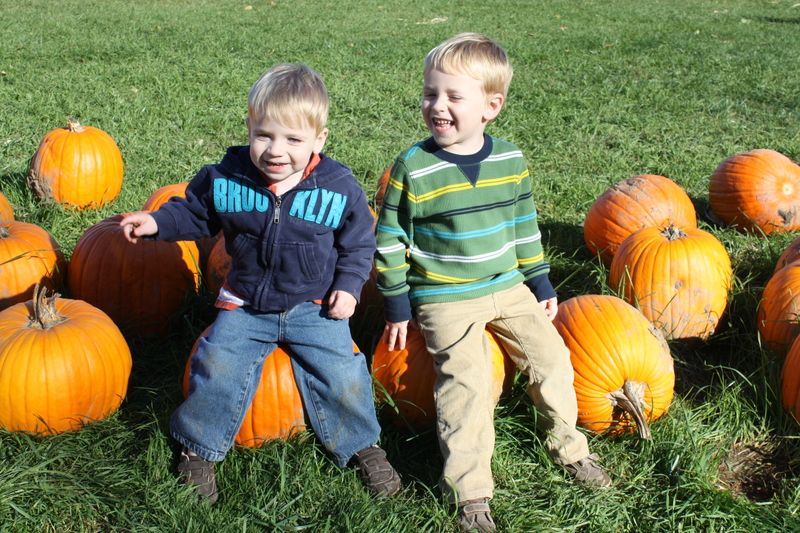 This past weekend, we took the kids to a great little place called, The Hollow, where every year we enjoy pumpkin picking and assorted fall festivities. There’s a small petting zoo (with a strange animal we dubbed a puppy-cow), a giant ‘sandbox’ full of dried corn kernels, small ride-on tractors, and piping hot, fresh apple fritters. 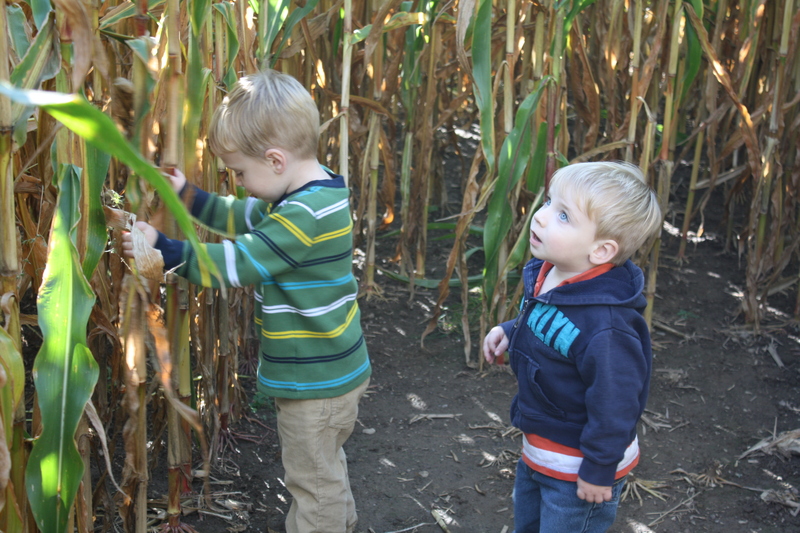 For the first time this year, we even took the kids into the corn maze, which our three year old managed to guide us out of with only one small wrong turn and minimal panic. Then, of course, there are the pumpkins. This year, we finally remembered to bring a wagon so we could carry more than one or two pumpkins back to the car. Pumpkins, pumpkins, pumpkins! 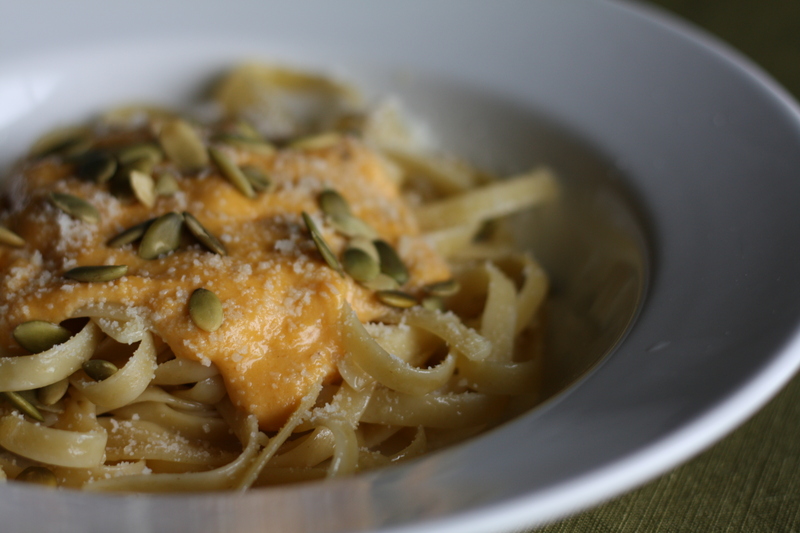 I love a good pumpkin parfait or a sweet and spicy pumpkin pie, but pumpkin also works beautifully in savory dishes, like my flavorful Pumpkin Alfredo Sauce over Fettucine. Have I got your attention? This recipe is beyond simple and unbelievably delicious. I honestly squealed with delight when the spoon entered my mouth. I start with a basic alfredo sauce of butter, cream, parmesan cheese, and a touch of garlic. Then, I add a generous amount of pumpkin puree to the creamy sauce and stir. Simple as that. The result is pure autumn magic. Seriously, I promise that you won’t be disappointed! I’d intended to do a photo guide on preparing fresh pumpkin puree to accompany this post, but the day took on a life of its own. Soon, I promise. In the meantime, canned pumpkin puree will work perfectly. Just be sure that pumpkin is the only ingredient. *I used chicken tenders, seasoned with salt and pepper, then baked at 400 degrees for 15 minutes. Cook fettucine according to package directions. While the pasta is cooking, prepare the sauce. Melt butter in a saucepan or skillet over medium heat. Add the garlic and cook for a minute or two. Turn the heat down to medium low and add the cream. Whisk to combine. Bring the mixture to a gentle simmer and cook for a few minutes, stirring frequently, until the sauce begins to thicken. Add the cheese and whisk to combine. Whisk in the pumpkin puree and continue cooking for another minute or two. Taste and add salt and pepper, if desired. (The cheese already adds a good deal of salty flavor, so you may not need any extra salt.) If the sauce becomes too thick, add a little extra cream or even a touch of milk to thin it out. To serve, spoon some of the hot sauce over cooked fettucine. Top with the warm chicken, pumpkin seeds, and additional parmesan cheese, if desired. Posted in Cheese, Food, Main Course, Recipes, Sauces and tagged alfredo, chicken, Cooking, Food, food photography, kids, life, pasta, pumpkin, Recipes, vegetables. Bookmark the permalink. That looks great. I am trying this next time I make pasta. Stop now! I’m begging you! This is too much! YUMMY!!! I am SO glad the pumpkin shortage is over, because now I can make yummy recipes like this! Looks fantastic. Definitely one to save for later! Brilliant, the sauce just seems brilliant! This is so worth me breaking into my (expensive) low carb pasta for! This sauce is wonderful! I made it vegetarian and added a few vegetables (red peppers, onions, mushrooms) to the sauce and it really helped to round out the flavors.